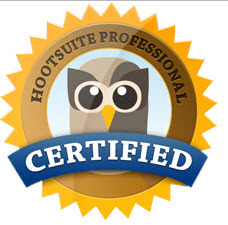 You are here: Home › Geekery › I’m HootSuite certified! Not a bragging point by any means, but going through the HootSuite Certification process taught me about features that anyone engaging in social conversations in any size organization can leverage and love. Localized geo-based search parameters… Great if you’re tracking events or specific locations. Bulk scheduling… I’m a fan and have been using other tools to support the many industry events EMC attends. URL parameters… Hello! Great feature enables you to easily tie social traffic to your web analytic program. ROI anyone? LinkedIn Groups… Yup, an easy way to monitor the discussion. Keep it up, Team Owl. Want to increase your Twitter transparency?